According to the International Monetary Fund, Venezuela's inflation will skyrocket to one million percent by the end of the year as the government continues to print money. 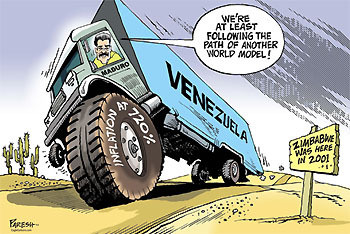 Venezuela President Nicolas Maduro’s proposed solution? Strike five zeros off the bolivar bank notes. Imagine watching your life savings of 1,000,000 bolivar notes instantly shrink to just 10 bolivars! The hyperinflation, collapse in economic activity, and lack of public goods and affordable food in Venezuela are now causing a huge migration into neighboring countries. This government-created famine is occurring right now and the America media have mostly ignored the story. For Venezuelans working at the government’s minimum wage, it now costs more than three weeks of labor to afford one cup of coffee in Caracas. It’s no wonder hundreds of thousands of Venezuelans are fleeing this hunger and hyperinflation as their President blames the crisis on an 'economic war' waged by political opponents at home and abroad. This is the exact same type of hyperinflation that hit Germany’s socialist Weimar Republic following World War I as the cost of goods was rising literally by the minute. The Weimar government decided to revive the economy by abandoning capitalist principles and printing endless amounts of paper money created out of thin air. By the law of supply and demand, vastly more money was available to buy the same amount of food and other goods; the price of everything rose stratospherically as paper money became cheap - and then worthless. The socialist Weimar government did far more than undermine the people’s belief in hard work, savings, and the integrity of money, banks, and the government - it threatened the moral basis of society. We are watching the same unfold in Venezuela today. Could the same thing happen here in America? As I explained in my book Money, Morality & The Machine, if a society’s money loses value, that society will also lose its moral values. Socialism almost inevitably debases government paper money to maintain and expand its power. That debasement causes inflation which debases the fundamental work ethic and honesty of society. This same hyperinflation could happen in America because of the rapid socialist drift, but with the right preparation you can survive and even thrive when it happens. This is why people have relied on gold as a secure shelter for their earnings and savings around the world for thousands of years. Red October! Is This Wall Street’s Big Correction?